Margaret Mitchell & John Marsh – Peachtree Publishing Company Inc.
Based on almost 200 previously unpublished letters and extensive interviews with their closest associates, Walker’s biography of Margaret Mitchell and her husband, John Marsh, offers a new look into a devoted marriage and fascinating partnership that ultimately created a Pulitzer Prize–winning novel. This edition of Walker’s biography celebrates the seventy-fifth anniversary of the publication of Gone With the Wind in 1936. 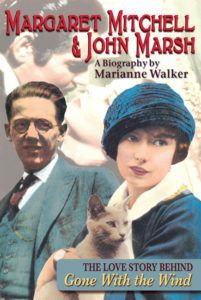 In lively extracts from their letters to family and friends, John and Margaret, who also went by Peggy, describe the stormy years of their courtship, their bohemian lifestyle as a young married couple, the arduous but fulfilling years when Peggy was writing her famous novel, the thrill of its acceptance for publication and its literary success, and the excitement of the making of the movie. In telling the private side of this twenty-four-year marriage, author Marianne Walker reveals a long-suspected truth: Gone With the Wind might have never been written were it not for John Marsh. He was Peggy’s best friend and constant champion, and he became her editor, proofreader, researcher, business manager, and the inspiration and motivation behind her writing. At every point, including the turbulent years of Mitchell’s first marriage to Red Upshaw, it was John who provided the intellectual stimulation, emotional support, and editorial insights that allowed Peggy to channel her talents into the creation of her astounding Civil War epic. From years of meticulous research, Marianne Walker details the intimate and moving love story between a husband and wife, and between a writer and her editor. Marianne Walker has written for the New York Times Book Review and the Louisville Courier-Journal. She is a professor of English and philosophy at the University of Kentucky/Henderson Community College, where she has taught for seventeen years. Born in Monroe, Louisiana and a graduate of St. Mary’s Dominican College in New Orleans, she received her M.A. from the University of Evansville in Indiana in 1976. Ms. Walker lives in Kentucky.